Owners of multi-family properties may at one point realize that they have the potential to convert to condos. Either the owner wants to keep one for themselves and unload the rest, or they need to sell all of it, but wants to maximize their profit on the sale. A two family, for example, turned into two condominiums would increase the value of the property and theoretically sell for more than if the owner sold the property as is. 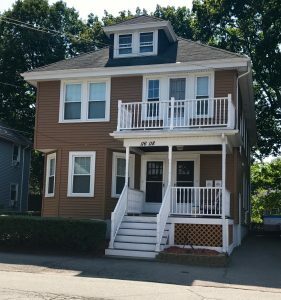 Multi-families in Massachusetts, as of 2018 Mid Year Report, sold for an average of $460,067 and condos sold for an average of $352,402. Using these numbers, if a 2-unit property, valued at $460,000 was converted into 2 separate condos, each valued and sold at $350K, the seller would turn a $700,000 profit which is $240K more than if they kept it as is. The first place to check would be the town or the city in which the property is located. Properties are zoned for specific types of use, which generally pertains to the utilities allotted to the space as well as parking. The other thing to figure out is if the lender will allow it. If there is still a mortgage on the property in question, the loan will have to be partially released or refinanced into 1 or 2 parts which will have to be paid in chunks as the units sell off. Unit-owned areas are spaces in the property are exactly what they sound like; owned by the unit owner. Exclusive use areas are those determined to be included in each condo’s floor plan and will be privately used by the owner or occupant of each unit, but are technically common areas. Often this includes storage areas and outside areas like patios. Common areas, typically including stair wells, driveways, walkways, and laundry rooms, are those that can be used by everyone living there. Once you have the survey and floor plan drafted up, they need to be submitted to an attorney that specializes in these conversions who will draw up the legal documentation for the conversion. These include master deeds, rules, and regulations, condo association inception, among others, all of which will then need to be filed at the registry of deeds. There are many things to consider when deciding if this conversion is the right choice. It’s not only about maximizing value- the market needs to be considered, as well as location, demand in that area, among other factors. One of our real estate experts at Lamacchia Realty will be able to guide you through this process. Contact us today if you’re considering this undertaking and we can help.